I seem to be on a roll with chai-spiced apple recipes this season which I am not at all sorry about (because both of these makes your house smell A M A Z I N G and oh so fall). Ever since my mom moved into her beach home near Lake Michigan in May, I’ve been up to visit her at least once a month. We’ve already worked ourselves into a little Saturday routine which consists of browsing her nearest farmers market and then stopping at both a small Swedish bakery for pastries and a cute little grocery store / coffee shop for sandwiches to pack for a lazy afternoon at the beach. One the last trip up there a few weeks ago, I picked up a really delicious iced Chai Cider which should honestly be the official drink of September because it was the perfect mix of fall spices while still being a refreshing warm weather thirst quencher. As I was sipping on it, I couldn’t help but think about how simple it was – I’m sure it was just half local apple cider and half of their homemade chai mix they use in lattes. Genius! I knew I had to create my own. 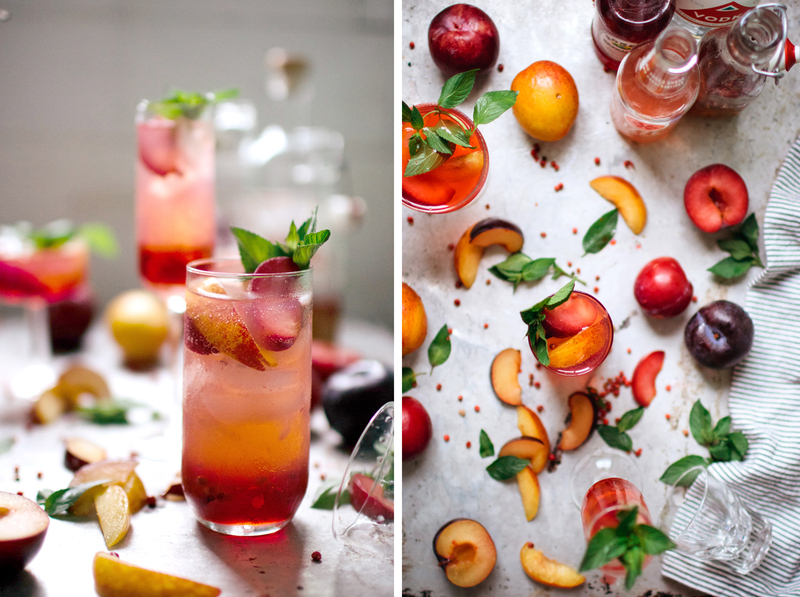 10 Drink and Cocktail Recipes To Keep You Cool This Summer! First off, I didn’t post yesterday because I was with family but I just want to say that I am so thankful for all of you here! So many of my favorite opportunities would not be possible with VV and VV would not be possible without all of you. You are the best. And happy BLACK FRIDAY! Did you wake up at 2 AM to wait in line for that new laptop? Oh wait, I’m still living in 2001 – stores open at like 8 PM on Thanksgiving now. Or does everyone just do their Black Friday shopping online these days? 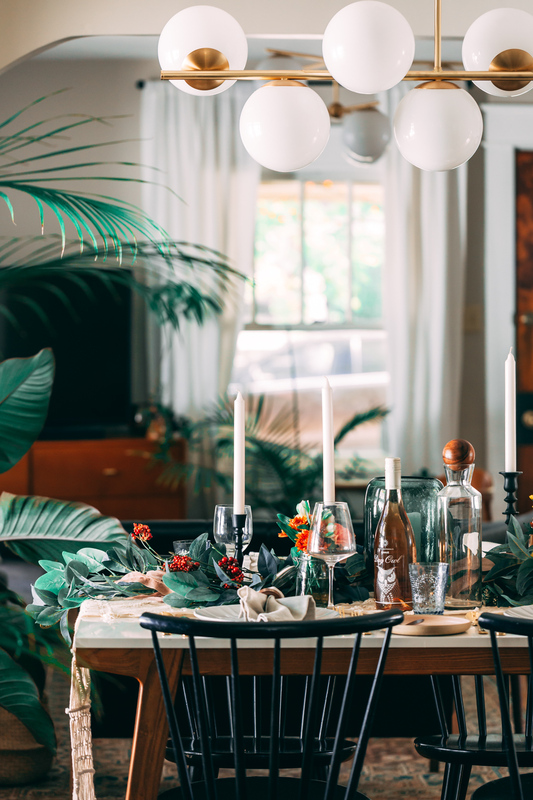 I’ll admit that I’m guilty to snagging a few deals today on CB2 and West Elm for our new house (which we are closing on in ONE WEEK! eeeep!). This bubbly Pomelo Gin Fizz cocktail skips the egg whites and uses citrus to bring a subtly sweet and tart tang to your next happy hour. They say that life happens in waves and I definitely feel like I’m riding one of the big waves right now. After a week in the Pacific Northwest exploring and photographing, I came home for 2 days (one of which we looked at a house and then immediately put a bid on it) and then hopped back on a plane for a vacation in southern Florida. For the first time in my Midwestern life, I smelled the salt of both the Pacific and the Atlantic in the same week! And if two adventures across the country weren’t exciting enough, the bid we put in on the house was accepted and we will be moving into the next phase with that this week! 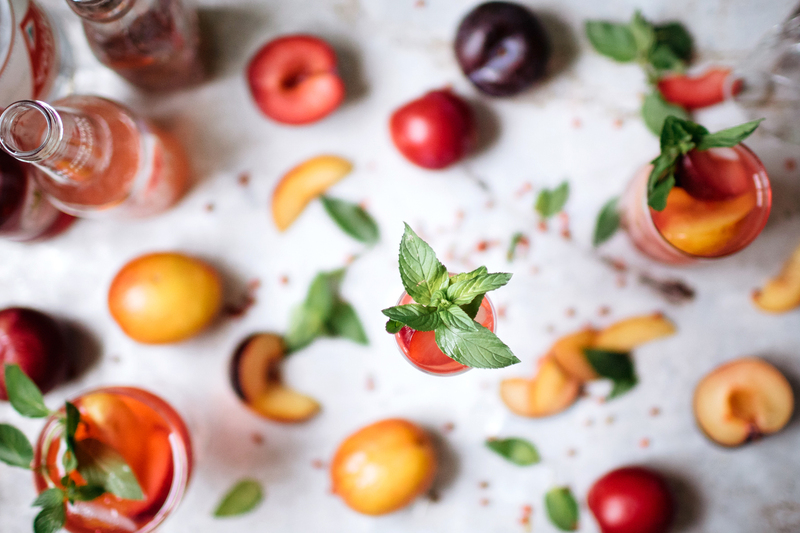 This Sweet Beet Strawberry & Tarragon Vodka Smash is a unique and fun summer cocktail. The savory sweet beet tarragon simple syrup blends perfectly with juicy strawberries. This recipe was made in partnership with Prairie Organic Spirits. I’m really excited to share today’s drink recipe with you. 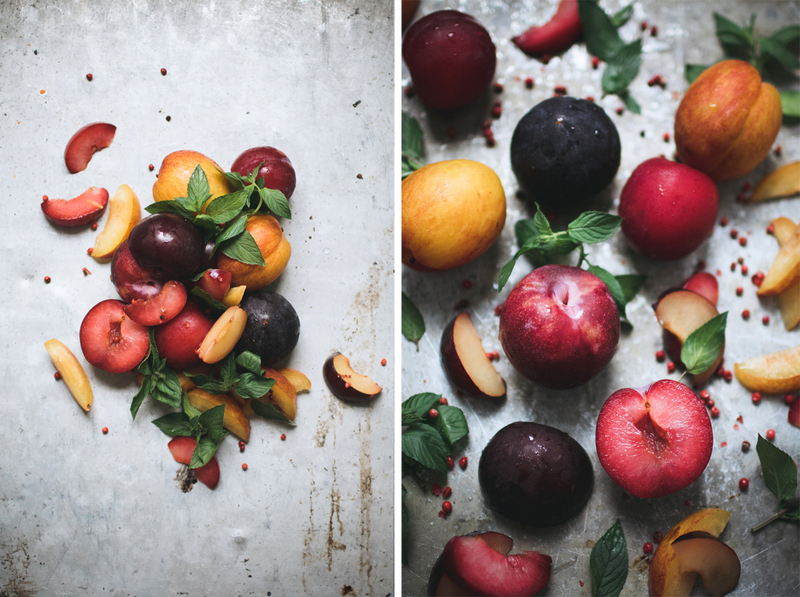 If you are a regular around here then you probably already know that I make a hobby out of throwing vegetables and unlikely fruit pairings into my cocktails for a unique flavor boost. Today’s recipe is no exception. Although my favorite profile flavor combo has always savory and sweet, earthy and sweet has slowly been creeping in at a close second. 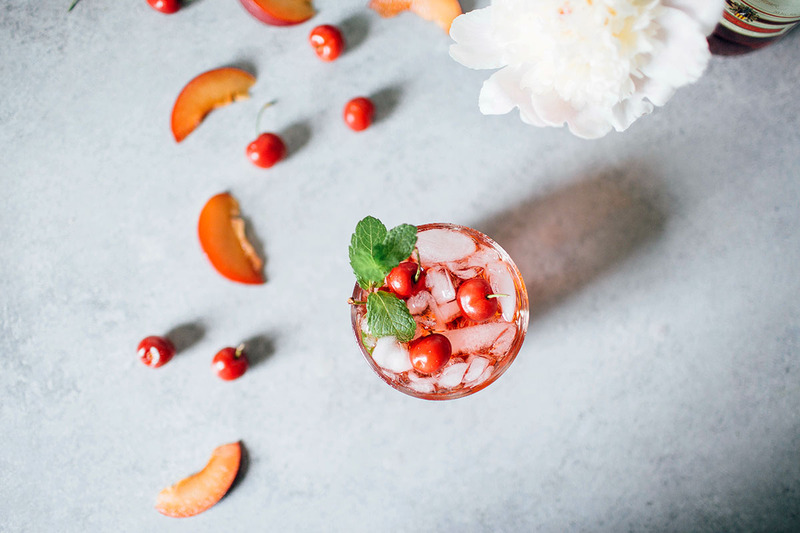 This Sweet Beet Strawberry & Tarragon Vodka Smash covers all the bases: sweet from the fruit, earthy from the beets and tarragon, boozy from the vodka, and refreshing from the top off of sparkling water. 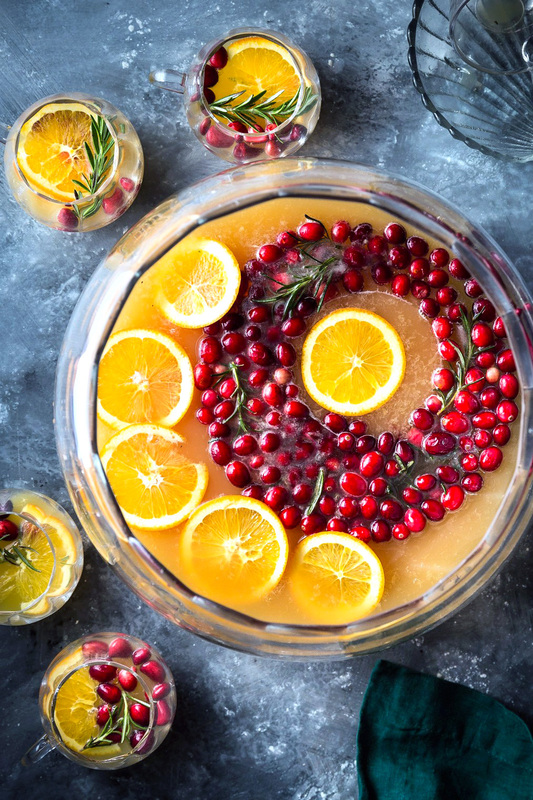 It is whipped up in a pitcher for a quick turnaround for your guests. 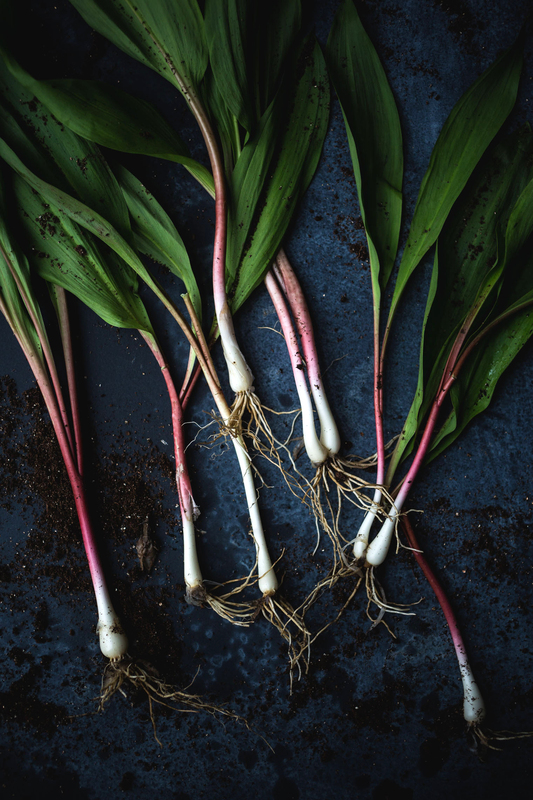 You need to be careful when making the beet tarragon syrup as the tarragon can quickly over flavor the entire syrup if it steeps for too long. 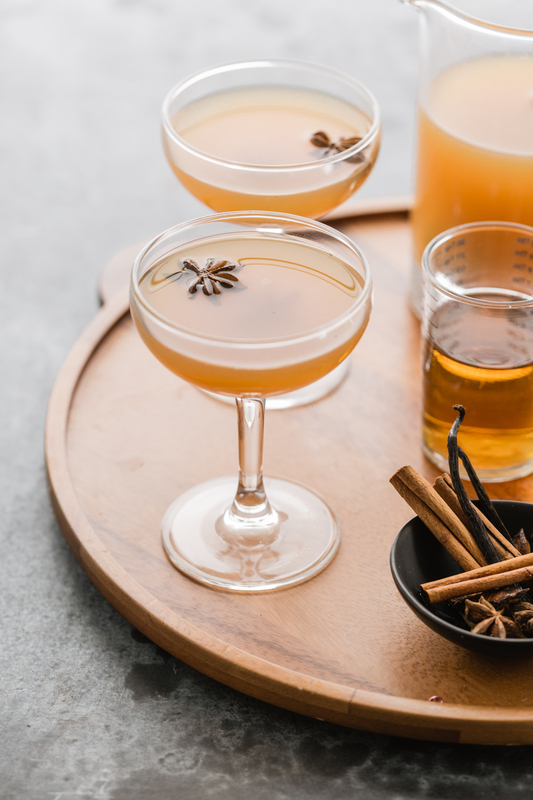 A tiny hint of tarragon brings an extra level of herbiness to this drink but too much tarragon flavor will leave the cocktail with an unappealing licorice taste. 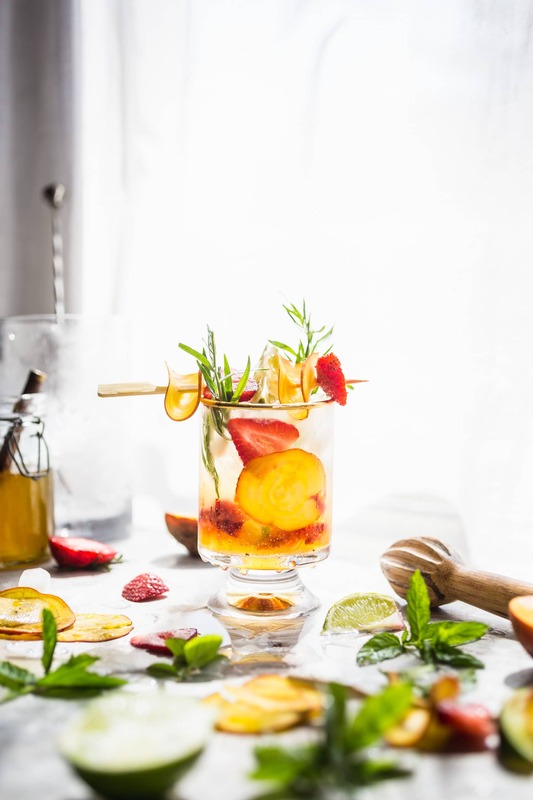 If you don’t have tarragon or are not a fan, you can skip adding any herbs to the syrup and then muddle a few mint leaves with the strawberries for a brighter and fresher cocktail. I used Prairie Organic Vodka for this cocktail and was excited to find the mellow flavor left no bad alcoholic aftertaste for these. I must say that I always seek out organic produce but never thought to do so with my alcohol until now! This vodka is smooth and doesn’t overpower the cocktail like a cheaper brands might. Make sure your strawberries are ripe and juicy because we want them to be adding a natural sweetness to this cocktail that will be missed if the strawberries are dull. This Sweet Beet Strawberry & Tarragon Vodka Smash is a unique and fun summer cocktail. The savory sweet beet tarragon simple syrup blends perfectly with juicy strawberries. Add golden beet chunks, granulated sugar, and water into a saucepan over medium heat. Bring to a boil, lower to a simmer, and let simmer for 10 minutes. Remove from heat, add tarragon, cover, and let sit for another 15 minutes. Strain syrup into a clean jar. Let cool completely before using. Add syrup and strawberries to a large pitcher. Use a muddler or handle of a wooden spoon to smash the strawberries in the bottom of the pitcher. Add lime juice, vodka, and sparkling water. 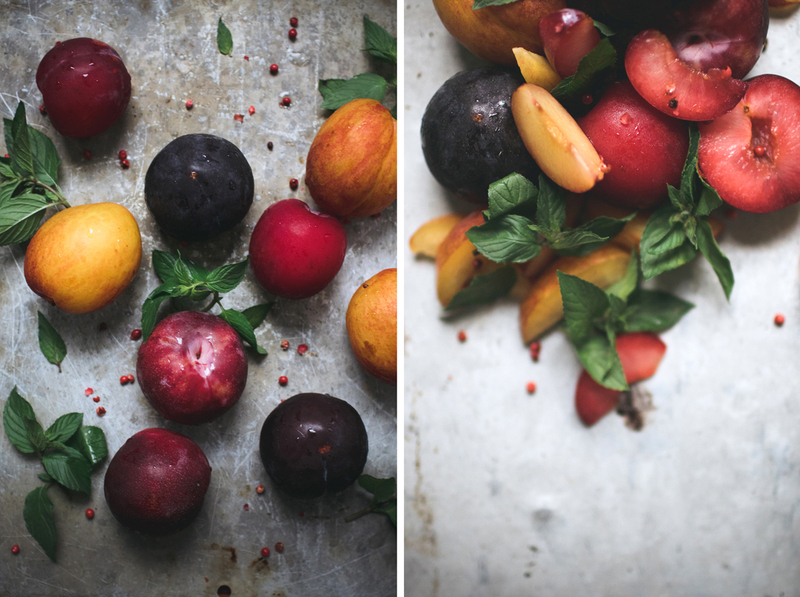 Garnish with beets, strawberries, tarragon, and mint. This post was made in collaboration with and sponsored by the generous folks at Prairie Organic Spirits but all opinions expressed are my own. Thank you for supporting the brands that make VV possible. Enjoy responsibly, 21+ only. 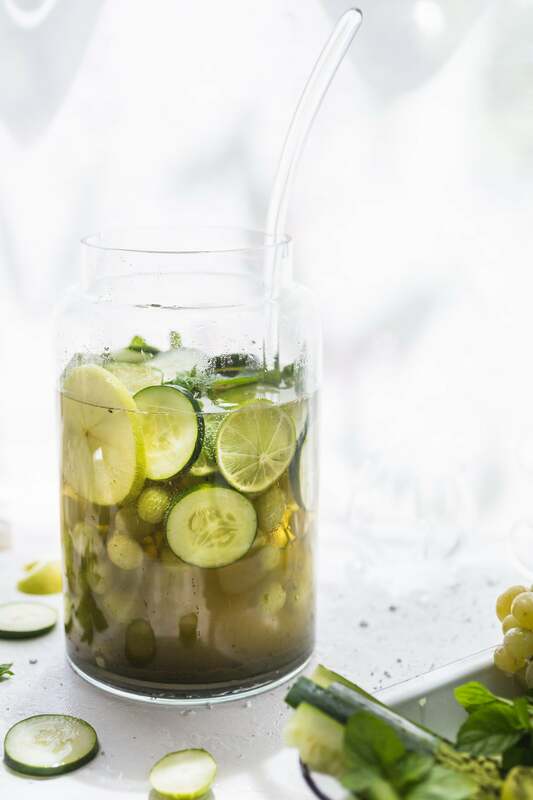 This Green Matcha Sangria recipe is a perfect mix between earthy matcha and sweet white wine. Remember when Starbucks made matcha lemonade a big thing earlier this summer? Well it got me thinking about other ways I could enjoy matcha during the hot summer months (because, let’s be honest, a steaming hot full-fat matcha latte is not very appetizing in the muggly heat that is August) and my mind immediately wandered to alcohol. A matcha gin and tonic? No, too simple. A matcha mojito? Already overdone. 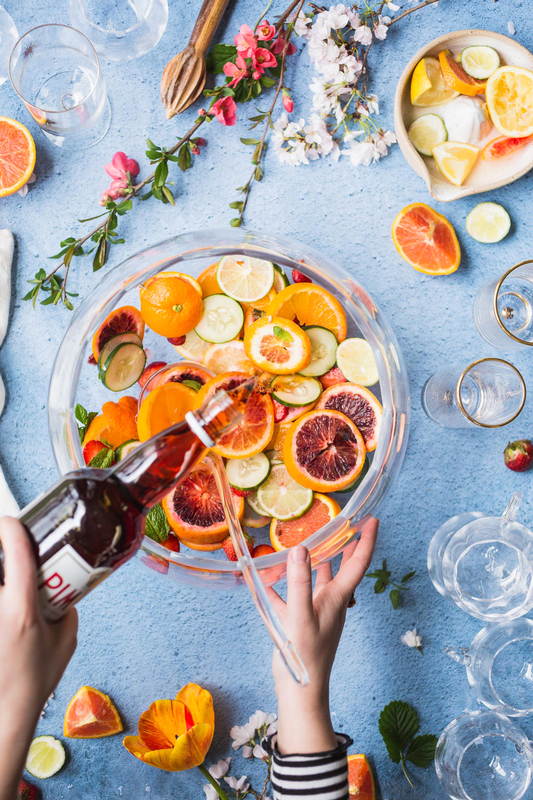 And then the light bulb went off – what about in sangria? 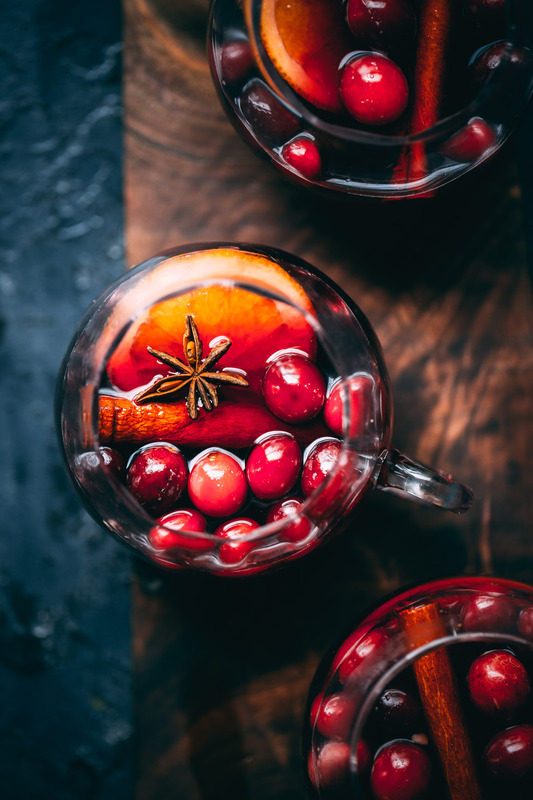 I did a quick search on my blog to find that I’ve never done a sangria recipe (which is absurd because it’s always been a drink of choice between my mother and I ever since I was old enough to drink). 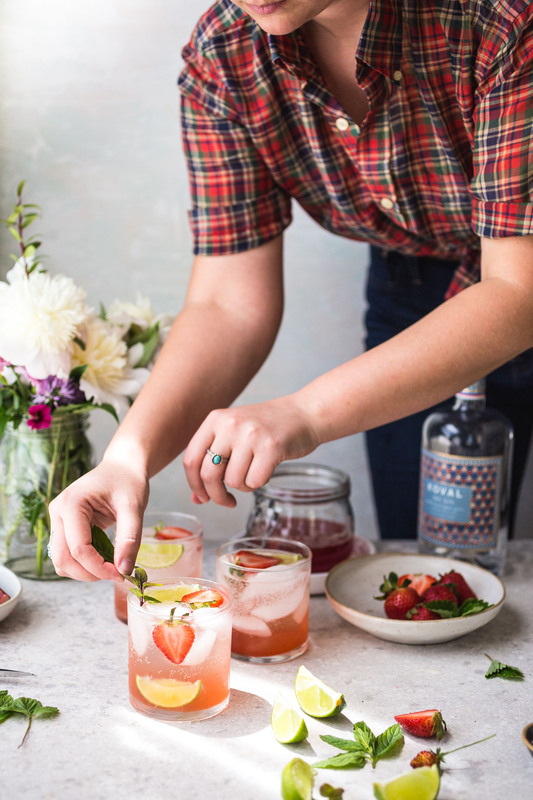 This Strawberry Rhubarb Gin & Tonic recipe is the perfect spring (/ early summer) twist on a gin and tonic. It’s light, refreshing, and has the tiniest hint of sweet. 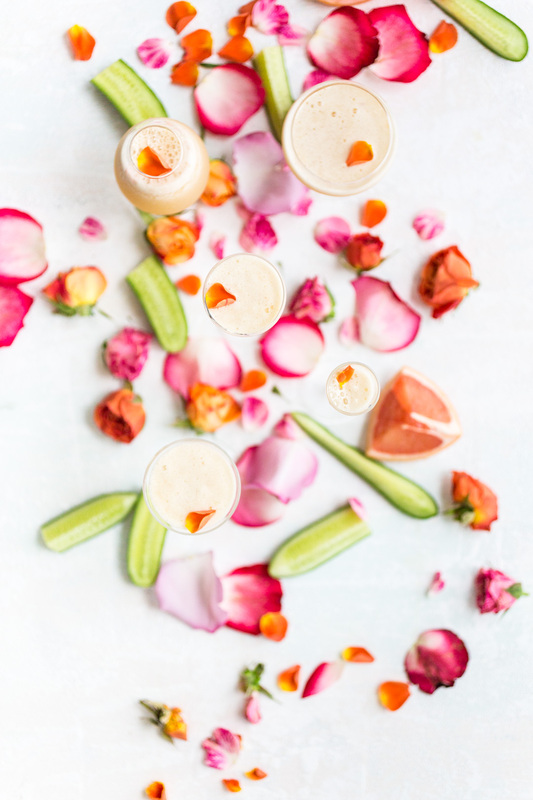 Pink Grapefruit Cucumber Rose Skin Quencher recipe from Lily Diamond’s new cookbook, Kale & Caramel, is a simple natural beauty drink recipe. Heyyy friends! Today is extra special because it’s my dear friend Lily Diamond’s book launch day! She was one of my favorite friends to confide in through the writing process for Vegetarian Heartland and I hope she feels the same for Kale & Caramel. When it comes to writing a book, there are a ton of stressful deadlines and so many highs and lows as you bring this giant project, that you’ve put your whole self into for years, into the world. With Lily also having a spring ’17 book launch, she went through these processes at a similar time as me so we were able to bounce experiences off of each other and cheer each other on. 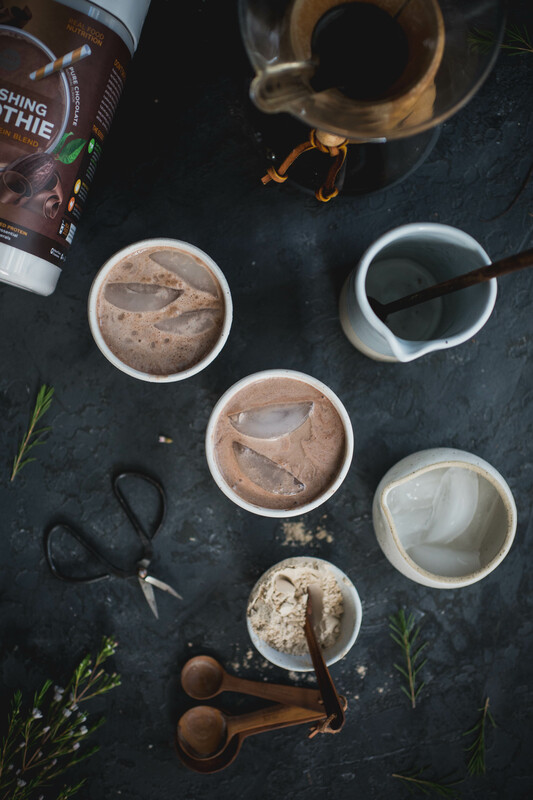 This Iced Cocoa Coffee Smoothie is the perfect morning or afternoon booster with iced coffee, blended dates, chocolate OLLY Smoothie powder, and vanilla all coming together to create a healthy iced coffee concoction. I’m going to start out by mentioning I’m not a smoothie girl. 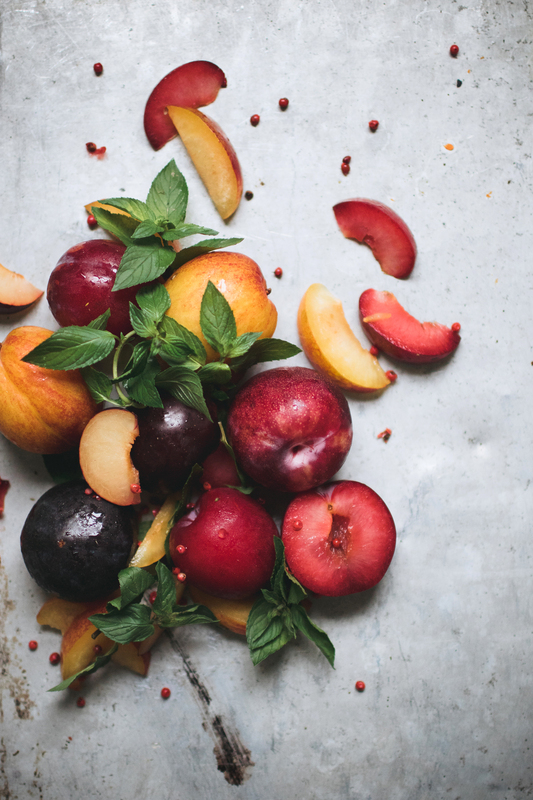 Sometimes, because this is a meat-free blog, VV gets grouped into these ‘special diet’ categories with all the other folks working on their yoga poses, superfood salads, and beautiful smoothie bowl game. Don’t get me wrong, I’m down with all those things on occasion but I just don’t identify with them. You know what I do identify with? Chocolate. You know what else? Coffee. Dang – do I love coffee. This drink I’m sharing today is called a ‘smoothie’ for lack of a better word – really, it’s like a super mix between a light chocolate shake and a dang fine cup of iced cold brew. I first discovered a similar shake (smoothie? frozen coffee concoction? frappucino?) a few months ago at a juice bar in Minneapolis. Our host didn’t have coffee but she had a big jug of a similar drink in her fridge. I still can’t remember exactly what was in it but I remember thinking it tasted like the best iced coffee I’ve ever had. I started making my own version when I got home and couldn’t get over how sweet that dates made the drink with zero refined sugar (and gave it a little creamy vibe as well). I usually make this for an afternoon pick-me-up with any leftover coffee I still have lingering on the stove. When OLLY mentioned they’d be sending me some nourishing chocolate smoothie powder, I couldn’t believe I hadn’t thought to put chocolate into it earlier. The OLLY powder gives both an additional nutrition boost AND an indulgent jolt from the chocolate. Afternoons can be rough for me. I wake up beyond excited to start the day and find my mind the clearest and most creative in the AM. From there lunch is great because well…I’m eating and I love to eat. But then around 3 or 4, I tend to crash – I’ve tried eating big lunches (to see if they would get me through dinner but they just bog me down even earlier) and light lunches (which leave me starving and without energy by 3) so I’ve accepted my body needs something else in the afternoon. 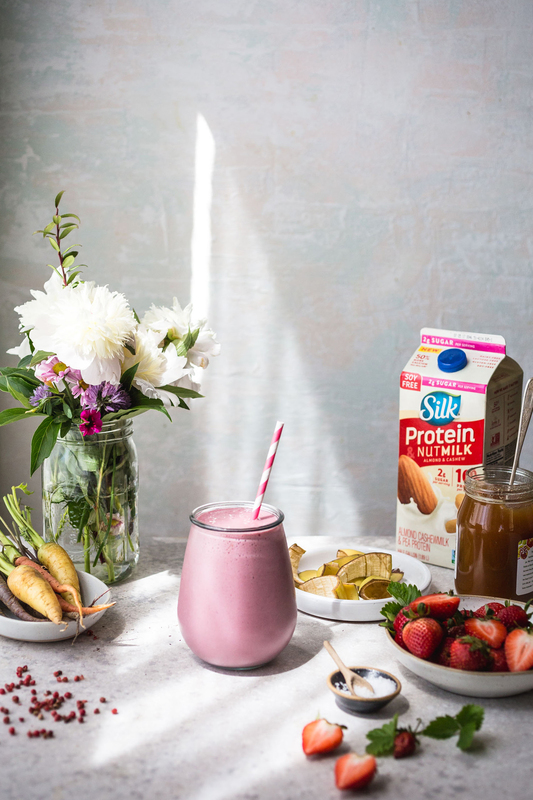 This healthy drink has been the answer for the last couple months – it doesn’t leave you with a sugar crash and I get a little bit of caffeine boost without the afternoon shakes that would come from a strong cup of coffee. Oh and I bet the boost of vitamins from the OLLY powder is a big help as well. You ever feel the afternoon slump as well? 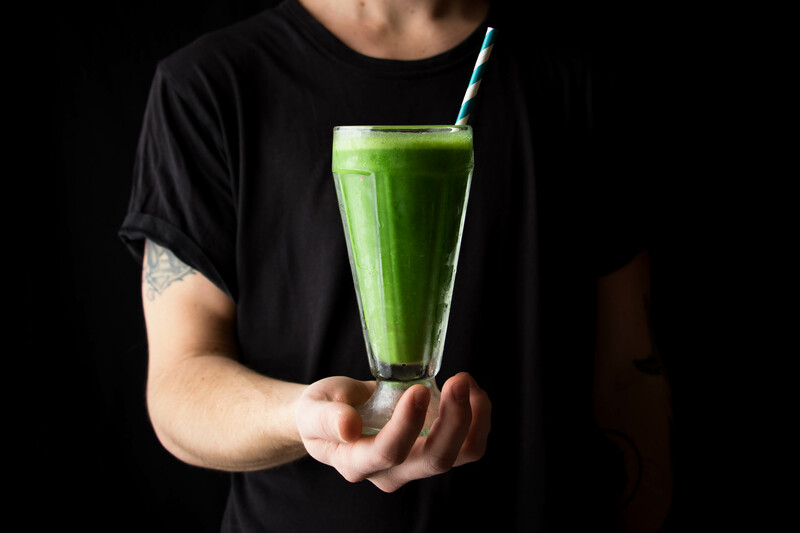 Try this drink – it positively could change your afternoon energy level forever! Note: Some days I’ve had enough caffeine by 11 AM to know when enough is enough. This drink is just as delicious with decaf if you’d prefer to switch to that in the afternoon. Also, I sometimes only blend together 1 cup of ice and reserve the rest to throw into my drink after to give it more of an iced coffee vibe – totally your call on how you’d like to do it! PSS Don’t worry, I’ve already been recipe developing a warm version of this for the colder months. I’m hoping to share that recipe later this season! BONUS! OLLY was kind enough to offer a giveaway for a chance to win over $1000 in prizes. To say thanks for playing, they’ll send you a $5 off coupon for target.com! ENTER HERE by Monday, October 17th! 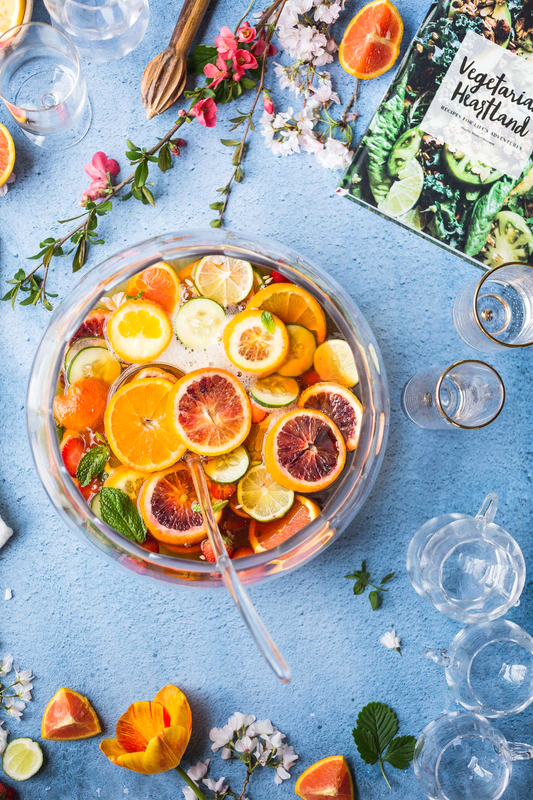 This Garden Tonic Punch is worthy of any summer cocktail party. It’s made up of the herb and vegetable bounty found in my own backyard. 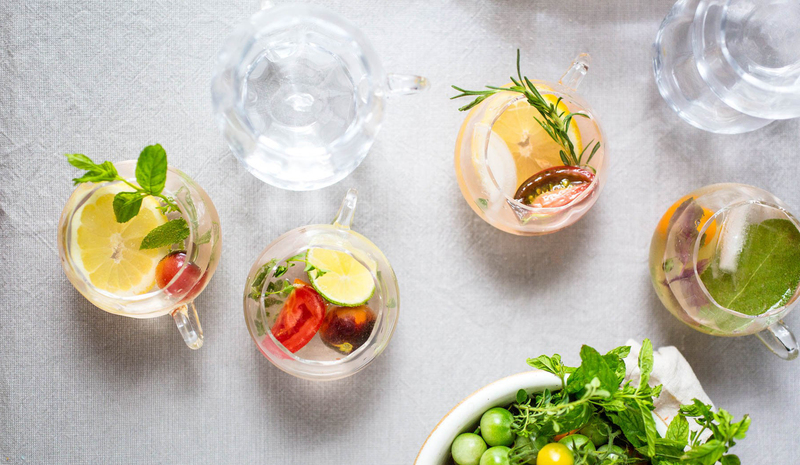 A cold-pressed tomato simple syrup combined with an easy herb syrup creates a refreshing summer gin cocktail ideal for big batches. Guess what!? Today I am celebrating these two things with this Garden Tonic Punch: 1. 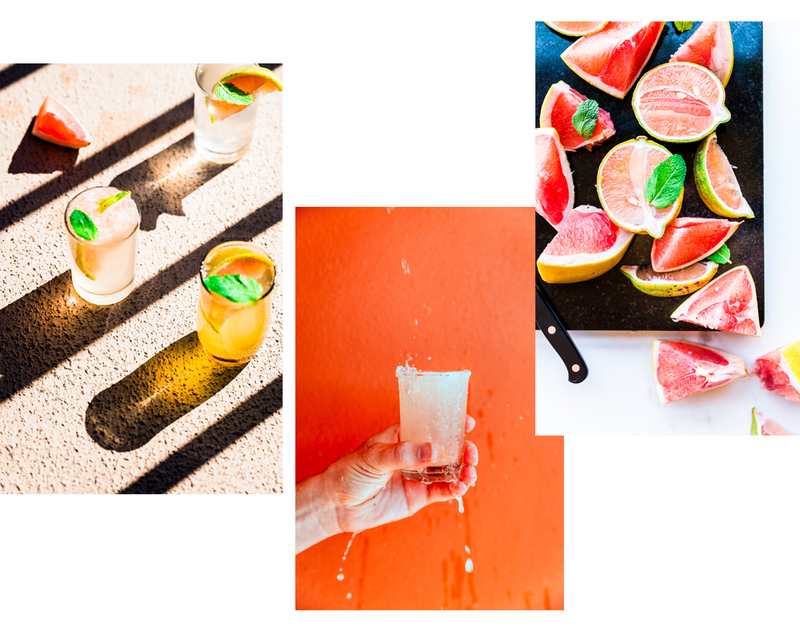 #drinkthesummer which is a fun little virtual cocktail party where all my favorite bloggers get together and mix up something fierce (see the full list of cocktails below) and 2. Vegetarian ‘Ventures FIVE year anniversary! Can you believe this space is FIVE years old (okay, it *technically* happened last week but who is keeping track)? Like imagine this space was a kid – she’d be HUGE by now… wanting to play dress up to look like mom and picking out her own ice cream flavors. But really, back to this space being a blog, this little space has grown up to host thousands of pictures, 534 posts, thousands of comments, millions of views (!!! ), writing in the form of dreams and desires, fears and worries, and a whole heck of a lot of recipes. Pretty cool, right? 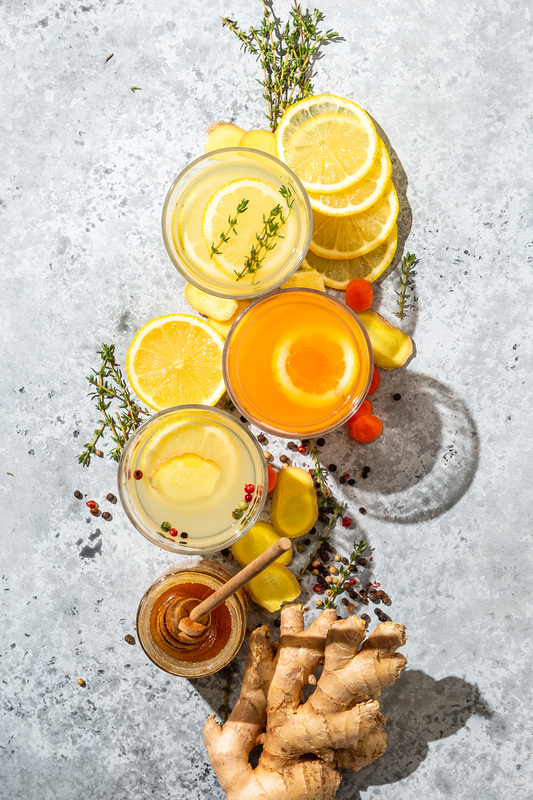 This tart and floral Elderflower Lemonade is a refreshing homemade drink that can be made alcoholic by adding a splash of gin or St. Germain. This past weekend, Wyatt and I took a quick trip up to Chicago. It has been too long since we went there without a work assignment and to just wander around. The main highlight was hitting up the Green City Market which made me feel like a little kid in a candy store; it had the best homemade bread I’ve ever tasted, rows of beautiful flower bouquets, edible flowers galore (yes! ), and any berry or green you could ever want (plus some you didn’t even realize existed). It really put our tiny town’s market to shame and I’m already wondering if it’s too ridiculous to move to a city just for their farmer’s market? I think not? 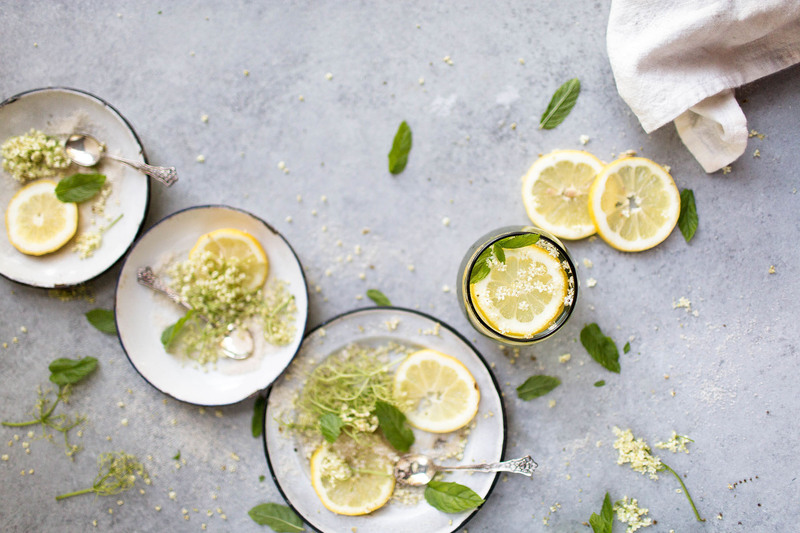 It’s no surprise that I have a thing for elderflower (I use the cordial constantly in cocktail recipes like St. Germain Spritzer and Garden Tonic) so when I stumbled upon the chance to purchase fresh elderflowers, I couldn’t pass them up. The white flowers are tiny but abundant and grow in large bunches. Most recipes I found for using it where to make a cordial; it sounds delicious but I didn’t want to seek out citric acid. So, instead, I went an easier route and created a simple syrup out of it that would still preserve it’s flavor but could be used for both non-alcoholic and alcoholic drinks. 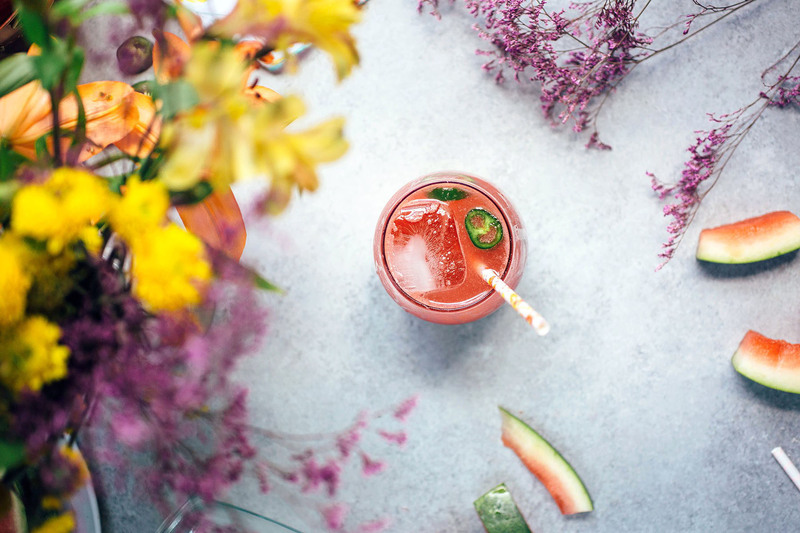 This homemade sweet and spicy watermelon soda is the perfect fizzy non-alcohol drink recipe to quench your thirst on a hot day. When anyone asked me where my favorite restaurant was when I was a kid, I always said The Root Beer Stand (our local drive-up diner). There was something about that drive-up experience that made me go crazy with excitement, like a dog waiting for his first walk of the day. Maybe it was the gallon (yes, gallon. Not liters – gallon!) of homemade root beer they brought out along with frosted mugs or the little trays that hooked onto your car window perfectly or that fact that we were allowed to eat in Mom’s car (for once) that made the unique experience so excitingly unforgettable. This novelty didn’t just get me when I was a kid either. Our local root beer stand closed down when I was in middle school but there was one in the town over that was a hot spot due to it being right by the beach on Lake Michigan. My two older cousins lived with us on and off when I was growing up and there were a few times where I’d convince my cousin, LM (her real name is Linda-Marie but we call her LM for short), to call into my high school pretending to be my mom and say I was sick. Back then I was dating this really fun troublemaker of a boyfriend who ditched often (without even bothering to have someone call him in) so he was totally down to hang out with us on those day hangs. We’d go to the town over and to the beach to avoid bumping into anyone we knew. We’d spend hours walking around the lake, bowling, and wondering antique malls. I remember demanding that we had to go to the root beer stand for a root beer float after hanging out at the beach and them teasing me for being so obsessed with the novelty of it. I can go all winter without touching soda but as soon as the weather starts to warm up, I begin to crave root beer because of those root beer floats. Despite the New York Times putting out an article this week about the negative effects of sugar (and soda in particular), my body still craves it. I decided to compromise and make my own homemade soda mostly made out of natural sugars (juice from the watermelon) to please my craving without totally throwing in the towel to sugar. This spicy watermelon soda is subtly sweet with a punch of spice for an insanely delicious and thirst-quenching refreshment. Note: I don’t like my drinks very sweet and I’m a total wuss when it comes to spice (lame, I know) so I kept the simple syrup level rather low. Feel free to start with that amount and add more to taste. 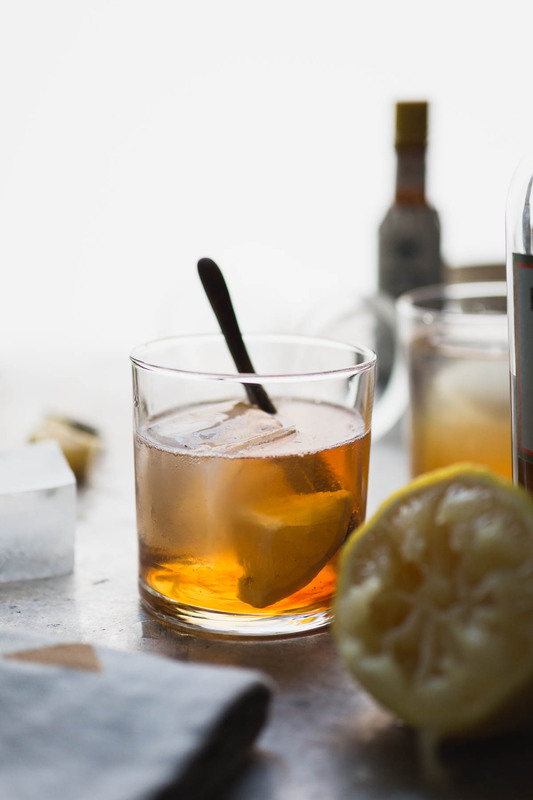 This four ingredient St. Germain Spritzer cocktail takes two minutes to whip up. 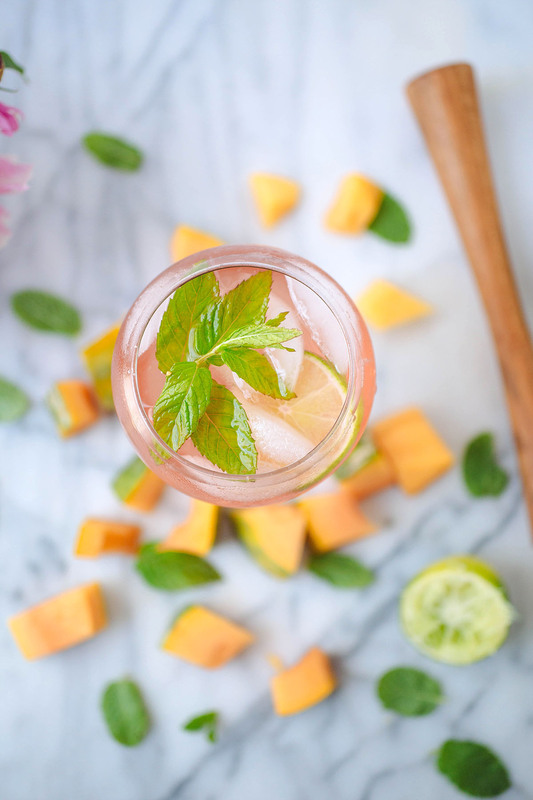 It’s the perfect refreshing alcoholic drink for a spring or summer evening. 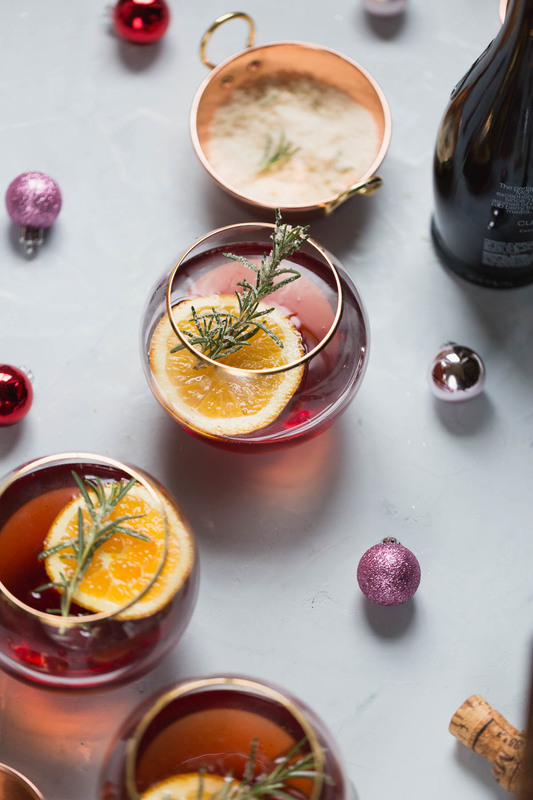 Before I jump into talking about this beyond simple cocktail, I’m excited to tell you all about the giveaway I am currently hosting over on my instagram right now! I’m not going to lie, between finishing up the book, working full time at my indie rock job, pushing the newest issue of Driftless Magazine into the world, and doing freelance work, our evening meals have really started to suffer. Sure, it’s great when I have to recipe develop tacos or lasagna but all too often I’m working on a drink recipe or dessert and those things end up being our dinner. So when Sun Basket sent me one of their weekly meal boxes to try out, I was so excited to have an excuse to set some time aside and make dinner again. Not only did it give me an excuse to get back into the kitchen for more than just work but the meals were delicious and ridiculously easy. I’ve had a lot of reservations with meal services in the past but Sun Basket has the perfect solutions for them all. Meal services always felt so wasteful with all the individual packaging of every ingredient but Sun Basket sends you a return label to send back all the packaging for them to reuse or recycle. I also hated the idea of a meal plan because of my meat-free dietary restrictions but they’ve covered that as well; they gave you the option to choose between vegetarian, gluten-free, and paleo recipes! And last but not least, I’m kind of a food snob and insist on all of my vegetables being organic so I was thrilled to find out their ingredients are certified organic! Yup, $11.49 for an organic meal that is delivered right to your door and can be whipped up in less than an hour. Dreamy, right? Now, onto the best part! I am currently giving away one week of Sun Basket meals (3 meals for 2, worth $68.94) over on my instagram! All you have to do it hop on over and tag someone you think would appreciate Sun Basket (whether it’s someone who never has enough time in their day or appreciates a delicious organic meal or has dietary restrictions or just loves to cook and try new recipes). Hop on over there NOW because the contest ends on Sunday at midnight (EST time)! Also, if you know for sure you want to try out Sun Basket, you can use this link to get $30 off your first order! How can you resist with a deal like that? Now onto this drink recipe! This is one of those recipes where I was trying to relax at the end of a day (this is a new development, by the way. My workaholic self is trying to slow down and enjoy a few silent moments a day) so I made myself this cocktail with ingredients we had on hand to enjoy with a novel on the porch. As I was sipping it, I was like ‘this is so good and looks so beautiful. I want to take a picture of it’. Fast forward 40 minutes later and I’m back to work, snapping pictures and writing down recipes (so much for that relaxing thing I’ve been working on, right?). This cocktail is beyond simple but that is what I really enjoy about it. It’s four ingredients. I can be whipped up in under five minutes. And it’s refreshing and light enough for the warming weather but boozy enough to keep you warm once the sun sets. Did you all have a wonderful 4th of July (to the U.S. followers) and long weekend? I sure hope so! We went up to a lake house in Michigan for the long weekend and had the most relaxing time! July has been speeding by at full force and it doesn’t seem to be slowing down. After spending the first long weekend on a lake house in Michigan, we spent last weekend up north at my stepbrother’s wedding and are now getting ready to head to Denver for my other brother’s wedding and a family trip to the Rocky Mountains. Between all of that, I’ve been busy packing orders for Driftless magazine (issue 3 is finally out!!) and taking long walks to ease that hyper boxer dog of ours. With all this excitement, I’m surprised I’ve even found time to eat, let alone cook! Needless to say, I’ve been relying a bunch on make ahead snacks and green smoothies.